Searching for internal audit services Melbourne? Look no further because the team at Kingston & Knight Audit has you covered from start to finish regarding internal auditing, risk management, and control review processes. If you are seeking to obtain reasonable assurance capability without establishing an in-house/payroll internal audit function, our internal audit services Melbourne are the answer. With a rigorous and disciplined review and recommendation process focused on the performance indicators that matter most to your organisation, we move you closer to the achievement of your objectives. With assurance comes credibility, and with outstanding service from an external firm such as Kingston & Knight Audit, assurance need not break the budget. Internal audit services Melbourne provide access to our objective, independent assurance consulting functions. Assurance functions to preserve and promote the sustainability, value, and efficiency of your organisation and its operations. This is a function that we perform as qualified, accredited assurance practitioners with over 40 years’ experience delivering professional financial services. Kingston & Knight Audit shares your vision, and it is our respect for your vision that motivates our disciplined, systematic internal auditing process. Our internal audit services Melbourne assist the client organisation or entity by conducting a comprehensive evaluation of control, governance, and risk management processes. The end goal of this process is to expand your vision by improving the effectiveness of these key performance processes. Our internal audit services Melbourne are designed to improve the overall functioning of your organisation or entity. We achieve this by delivering detailed, comprehensive analyses of the entity’s internal control processes and management of risk mitigation practices, financial reporting /planning procedure, and operational efficiency. By obtaining objective, independent advice regarding these key measures of performance for any effective organisation, you gain greater control over your organisation and its operations. Internal Audit Services Melbourne – Why Kingston & Knight Audit? Kingston & Knight Audit is proud to offer accredited independent audit and assurance services to clients here in Melbourne. Our extensive experience in the financial services sector ensures that we have the knowledge and skills to match your expectations. The role of your internal audit services Melbourne is to contribute to the effective and efficient governance of your organisation or entity. If the entity is governed by a committee or directors, our independent review will assist these parties in designing effective operations and management processes. Control (financial and non-financial), including compliance and financial reporting/management. Governance processes comprising the entity’s structure, function and management. Risk identification, risk management, and risk monitoring processes. By gaining control of these key performance indicators through the provision of independent, objective analysis from our Melbourne auditors, your objectives and vision can become reality. The internal auditing process is regarded as a vital component of the risk management as well as both internal and external control capabilities of any successful organisation. For clients who are a listed entity with the ASX, or are planning to obtain an ASX listing, you will be required to establish an internal audit capability. The ASX publishes a set of corporate governance principles which explain the standard of internal control and governance expected of listed entities. The ASX principles state that listed entities must either establish and maintain an internal audit capability, or explain why they have failed to do so. Any explanation regarding a lack of internal audit capability must comprehensively state the entity’s alternative internal control and risk management processes in lieu of an internal audit capability. This is vital to the operation and general functioning of any listed entity, as ongoing internal evaluation and improvement of control and risk management is expected of listed entities. Understandably, your organisation may not have the capability to establish an internal audit capability on its own. For large listed entities, the internal audit function is often overseen by the Chief Financial Officer (CFO). In recent years, owing to the rapid uptake and continuous development of financial services technology and improved transparency requirements for audit processes, the functions performed by the Chief Financial Officer are increasingly outsourced. Increased competition and greater access to financial services mean that outsourcing of the internal audit function is a popular, and effective, choice for listed or soon-to-be-listed entities. At Kingston & Knight Audit, we have extensive professional experience assisting organisations outsourced their CFO function, including internal audit capability. Our Melbourne auditors ensure that you maintain the internal audit function required as a listed entity, without the costs associated with establishing an in-house audit team. An additional benefit lies in the fact that the value of an internal audit function is often attributed to the independence of the auditor. By accessing independent internal audit processes from an external firm such as Kingston & Knight Audit, the quality of your internal auditing is greatly improved regarding its assurance value. The assurance process is built upon the provision of objective, impartial, and factual financial analysis and advice. Here at Kingston & Knight Audit, it is this independence that forms the core of our auditing practice. This is what enables our internal audit services Melbourne clients to obtain the highest standard of assurance available. The entity must establish an audit committee as an independent component the entity’s internal management. The audit committee is then responsible for establishing/maintaining the internal audit function for the organisation. This may be by setting up an in-house (employee) audit capability, or an approved external provider of audit and assurance services. When an internal audit is being conducted, the auditor should report their findings to the audit committee and not to the entity’s management. The internal auditor should provide a plan used to guide the internal audit process as it will apply to the entity. This plan should be reviewed by the audit committee, and approved prior to the commencement of the internal audit process. During the process, it is the responsibility of the audit committee and not general management to ensure that the internal audit is being conducted in line with the approved plan. The budget allocated for the entity’s internal audit function should be set with the input of the audit committee. It is important to note the fact that independent internal audit services may be delivered by an in-house audit team, on the entity’s payroll, an external firm, or a combination of internal and external contributions. One of the primary outcomes of an effective internal audit process is the evaluation and improvement of the entity’s internal control capability. Internal control refers to the entity’s achievement of its core objectives through the processes of management, directors, and other key personnel. Reliability of the entity’s management and financial reporting. It is usually management and key personnel who are responsible for the entity’s internal control capability. Therefore, an internal audit can be seen as a measure of these individuals’ performance in relation to fair and reasonable expectations based on objective information. 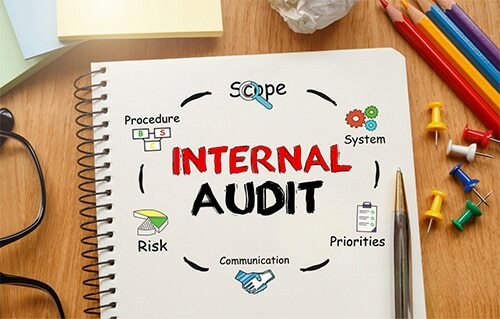 When you engage Kingston & Knight Audit for internal audit services Melbourne, you are assured that these key indicators of organisational performance will be rigorously and objectively evaluated. The internal audit process is critical in maintaining effective and efficient corporate governance. Internal audit procedure should involve the reporting of any critical issues with management control or operational effectiveness. The auditor’s report delivered by your internal auditor should include appropriate suggestions or recommended topics of discussion to be addressed at the meeting of the audit committee. This is why it is vital that the internal audit process is conducted independently of management influence. Perhaps the most fundamental role of the internal auditor is to assess the entity’s risk management processes. Risk management is a key indicator of an organisation’s capability with regard to its vision and objectives. It is a process of identifying, analysing, understanding, and responding to risks that pose an actual or potential threat to the achievement of organisational goals. Generally included in the scope of risk management are the entity’s overarching strategy, its operations, financial and management reporting processes, and compliance with laws and regulations. All of these are associated with important risks, both internal and external, to the organisation’s ability to succeed in meeting its objectives. Fraud risk is also an important feature of any internal risk review or risk management internal audit. Kingston & Knight Audit’s internal audit services Melbourne will enable the entity to establish and maintain an effective risk management system that encompasses all the relevant factors. Risk management is an ordinary and ongoing role performed by the entity’s management. However, regulations and standards generally require a more in-depth, standardised risk management process that can only be achieved through the audit and assurance process. Therefore, risk management and risk review functions form the core of internal audit services Melbourne as offered by Kingston & Knight Audit. Our Melbourne internal auditors ensure that the entity’s directors or responsible persons are advised with forward-facing measures of operational, management, control, and compliance risk. Kingston & Knight Audit provides a comprehensive evaluation that assists in the identification and addressing of emerging risks. In the auditor’s report, our Melbourne internal auditors identify whether the entity’s stakeholders have reasonable assurance regarding the effectiveness of the entity’s risk management processes. To organise the establishment of an audit charter or plan, get in touch with the team at Kingston & Knight Audit today. If you are not yet at the stage where you know what your internal audit requirements are, we offer a free initial telephone consultation to align your expectations with our services. Here at Kingston & Knight Audit, we understand that every organisation has its own vision, personnel, and operating conditions. We get to know your organisation, enabling us to more effectively deliver the assurance you require. So don’t hesitate, contact Kingston & Knight Audit today to find out more about our internal audit services Melbourne and what they can do for your organisation. Call our internal audit services Melbourne team on 1800 283 471 , or email us at audit@kingstonknight.com.au.